The People’s Summit: a vibrant, sprawling stretch of social movements in their full glory. White tents spread across kilometers of public park near the city center, alive with political activities, decrying a false green economy that encourages pollution and the buying and selling of natural resources. The United Nations Conference on Sustainable Development: located far from the city center, requiring official registration and buzzing with international delegates wearing slick suits. During Rio+20 and the parallel People’s Summit, waste pickers with the Movimento Nacional dos Catadores (The National Waste Pickers’ Movement of Brazil) carried out a constant stream of activities in their event space, a tent at the People’s Summit. 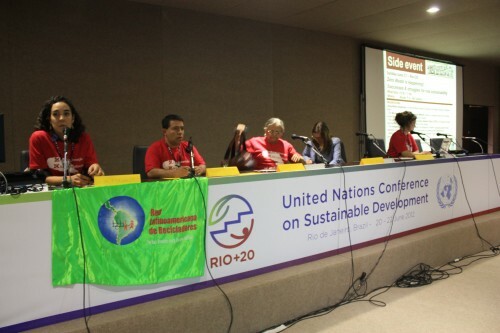 Some of the events included a plenary session on the closing of the open dumps in Rio de Janeiro and across Brazil, a presentation on the National Waste Policy of 2010, and panels about resisting incinerators around the world. 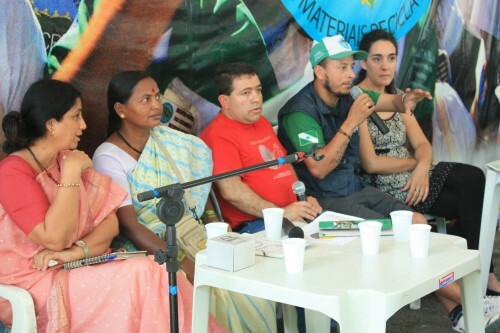 In a panel about the national and global contexts for waste pickers, leaders from India, Colombia, Nicaragua, the Dominican Republic and Uruguay exchanged experiences with the Brazilian waste pickers. Cardoso spoke about the shocking number of open dumps still spread throughout Brazil. In the northeastern part of Brazil alone, there are 1,750 open dumps where thousands of people earn their livelihoods, he said. “There needs to be a diagnosis of how many waste pickers are working in those dumps. The majority of the people working in them are women, many of whom are taking care of children,” he said. Sushila Sabale, of the Alliance of Indian Waste Pickers, who began working as a waste picker when she was 10 years old, spoke about how waste pickers desperately need to organize in order to make advances. Her cooperative is working towards Zero Waste and the inclusion of waste pickers in the solid waste management system. That includes health care, education, counseling, and ending child labor. These ideas were also taken to the U.N. convention center, Rio Centro, where the delegation of waste pickers talked about achieving Zero Waste in a way that includes waste pickers. This official side event also featured union representatives, environmental advocates, local government and community leaders and experts on solid waste management. Inclusive Zero Waste systems are an alternative to landfills and incinerators; and at the same time, they are an alternative to the privatization of waste management. 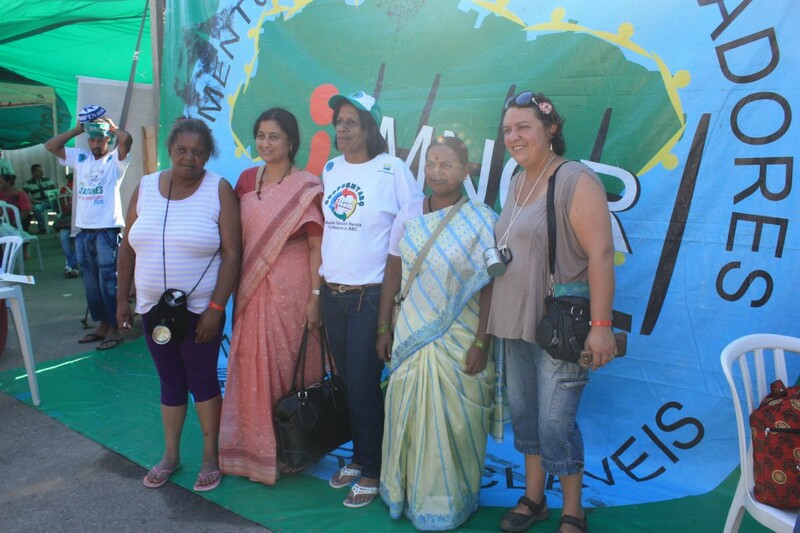 Guiomar Santos, a waste picker leader with the National Movement in Brazil, is involved in the fight against an incinerator in the municipality of São Bernardo, near the city São Paulo. Corporations sometimes say that incinerators are a solution to the worldwide waste problem – that incinerators create Zero Waste. This is not true, Santos, explained. Mariel Vilella, GAIA’s climate campaigner, presented the newest GAIA publication, “The road to Zero Waste,” which includes case studies on zero waste experiences from all over the world. In her presentation, Vilella denounced that the Rio+20 text supports energy recovery from waste as equal to waste prevention, reuse, and recycling. Jyoti Mhapsekar, of Stree Mukti Sanghatana – a women’s empowerment organization — spoke about the Zero Waste system that’s been adopted in the city of Mumbai, India. There, women waste pickers have been trained in composting and biogas. Alexa Kielty, with the Department of Environment of San Francisco, U.S.A., spoke about how residents there are now required to compost because of a Universal Composting Ordinance. In 2009, a three-bin system was introduced – one for trash, one for recyclable materials, and one for organic waste. Silvio Ruiz added that waste pickers need to be prioritized to provide municipal recycling services. “We believe that private companies need to deal with waste and waste management but don’t need to be involved with recyclable materials because this is what we do to survive,” he said.